I have translated a bunch of subtitles in my time, every time I did this was that I downloaded subs in English and then just translated them in notepad and saved as filename: "movie.srt". Now I translated one documentary and when I play the video with subtitle in that folder bsplayer get's an error message "error occured in application". The video plays fine without subtitle and all other videos play fine with subtitles. When I play the subtitle before I translate it, it plays fine. I don't know does it have to do something with the captions, but all the other subs with captions work fine for me. I don't know what's wrong, help??? If the original sub is playing without problems, there must be an error of some sort in the translated file. Can you upload/attach that sub (or a sample of it) so that we can test. It is text-based (.srt) so the file size will be fairly limited. I tried to upload subtitles to this forum but I keep getting "invalid file" error message. Can't you upload the offensive file as a .zip-file? Oh, I thought I can upload a .rar file but it seems I can't. I've meanwhile tested your files. The translated file did not cause an error in BS.Player, but it simply wasn't recognized as a subtitle-file. ... your translated file has -> (a single hyphen instead of two). When I simply generally replaced "->" by "-->" using Notepad and tried the translated file again, it was shown without any problem!! Thank you!!! You saved me a lot of time. I don't know why it changed that when I didn't touch that at all. Anyway do you know why does it now show me the number of the next subtitle line when there's only one line shown? It dosen't show it when there's two lines shown. If you open in notepad nothing strange to be seen? What build of BS.Player are you using? but again, when I load english sub it dosen't do that, only with the translated one. It must be that something changed just like on the previous problem, but I can't see anything different. If I enter another enter (two blank lines separating them) then it dosen't show it, why? Did you indeed use notepad or maybe wordpad (or another text-editor)? Can you post the offending file again (zipped)? Found the culprit: creepy Space Invaders !! you will see those (extra) spaces don't influence a correct display of subtitles. However when you don't use this "new" option, then the "old subs-engine" apparently supposes it has to show (its max) three lines, the second being an empty line and the third being the line-number (if followed by a space before the [Enter]). While testing it appeared to me that whereas the old subtitle-engine allowed a maximum of 3 lines (which IMHO is more than sufficient for normal subtitles), the new subtitle engine can almost just as well be used as a kind of telecue or teleprompter (provided the number of lines does not cause the top lines to be displayed over a black upper border -if present- (where the picture isn't refreshed)). Sorry for being a pain but I don't have that option in preferences/subtitles in my version. 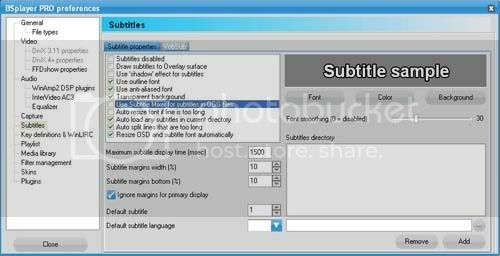 New subtitle parser/renderer was introduced with version 2.41.1003. Most recent versions at this moment are 2.51.1022 resp. 2.52.1023beta. I don't know when your Pro-licence expires/expired, but you can easily find out by logging into your user area. You can always download upto the latest Pro version within your licence-period. And most recent Free version can be downloaded by everybody of course. By the way: if you're using Pro-version, why aren't you using BS.Player-Pro's in-built subtitle editor in stead of notepad? Didn't know any of that!!! Ill download the latest version and try the BSPlayer subtitle editor.